Many families in Portoviejo, Ecuador are without clean water following the earthquake. 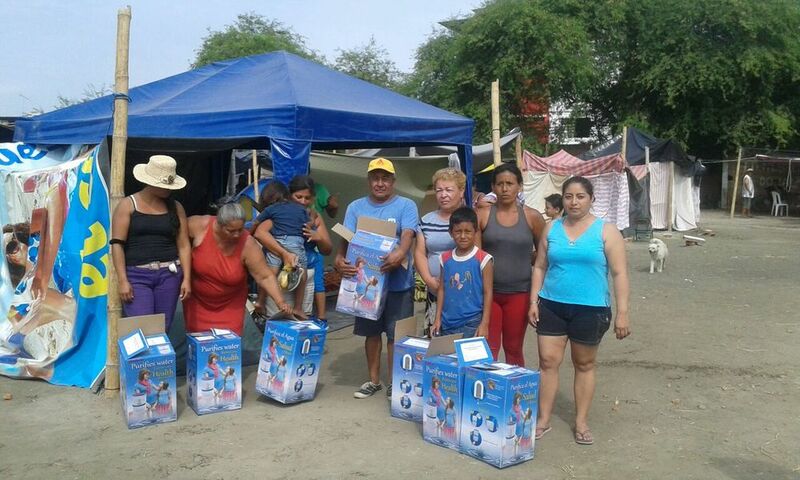 PADF and partners Paz y Esperanza delivered 660 water filters to quake victims in Portoviejo, Ecuador. PADF partner Paz Esperanza delivers supplies in Portoviejo. "The biggest necessity is reinserting these people into the economy," says Ruth Hidalgo, executive director of Ecuadorian nonprofit Participación Ciudadana. Their homes destroyed, many families are living outside during Ecuador's rainy season. The Pan American Development Foundation (PADF) is working with local partners Participación Ciudadana and Paz y Esperanza, nonprofit organizations in Ecuador, to provide aid to families affected by the devastating earthquake that struck on April 16. Through their countrywide network of more than 10,000 volunteers, the Ecuadorian NGO identified a town that had been particularly hard hit: the small fishing village of Tosagua, about 40 miles outside of the coastal city of Manta in Manabí Province. From Tosagua, a village of around 5,000 people, dozens of affected families were identified. Many families include elderly relatives, some have children with special needs. Most of the town’s resident’s earn a living from the tourism industry, making fishing nets or selling homemade candies. With infrastructure damage and many roads now impassable, their livelihoods are at stake. Hidalgo and her team are hand delivering supplies including mosquito nets, pedialyte and personal hygiene items such as diapers, soap and more. Volunteers have been communicating with the families daily to find out their needs. It is the rainy season in Ecuador and many people are living under harsh conditions outside. Hidalgo described talking to a fisherman in Tosagua who is sleeping outside under a trash bag with his wife, two children and two dogs. The delivery of relief supplies to Tosagua and other villages in Ecuador is part of PADF’s first response phase. The Foundation is also delivering water filters to families in Portoviejo. Having an international partner like PADF that’s familiar with local issues was key, says Hidalgo. “We have a very close relationship with PADF and they know exactly how Ecuadorian communities are. They know very well what they will need to rebuild. They are very close to our people. The very moment they knew about the tragedy, they contacted us. They said, ‘what can we do?’"